L'Antico Palazzo is a deceptively large, rustic stone house situated in Villa Bonicelli, a picturesque and peaceful hamlet in the beautiful Emilia-Romagnan countryside. It sleeps up to 12 people comfortably, making it ideal for families or groups of friends. 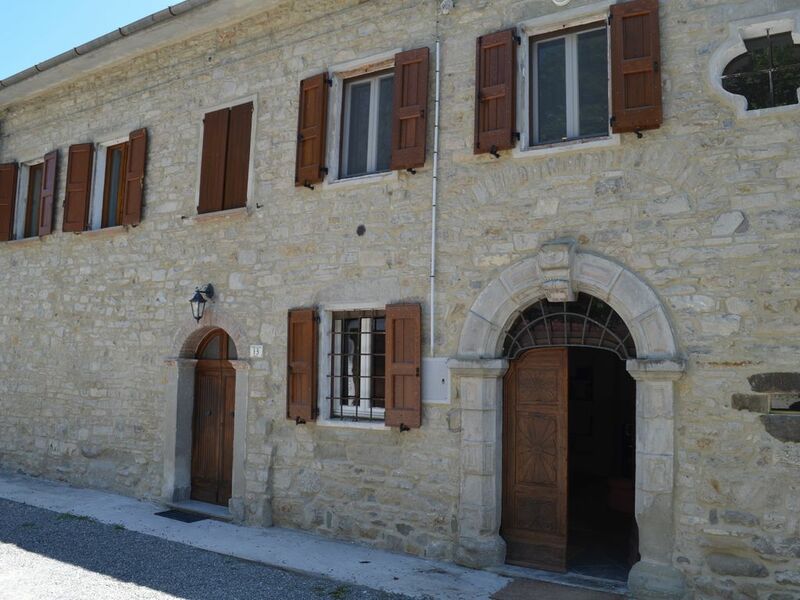 It can be rented as a stand-alone property or in conjunction with one or both of our other properties: La Stalla, a barn conversion located next door to L'Antico Palazzo and which sleeps 2-3 people; and Casa Vigneto, a three-bedroom house just a couple of minutes' walk away, across a small vineyard. An outdoor swimming pool with stunning mountain views is located behind L'Antico Palazzo and is shared between the three properties. L'Antico Palazzo is a historically interesting building, being part of the original 'casa padronale' (manor house) of the hamlet. It has been furnished partly with antiques and quirky one-off pieces that reflect its history. It really is an original holiday home from which to explore this stunning and little-known area of Italy. The beautiful arched doorway (clearly dated 1824, although the building itself dates back to the late 16th/early 17th century) opens onto a warren of rooms! First is a large and atmospheric drawing room. This opens onto another large sitting room, which is shared between two separate double bedrooms with beautiful views of the valley, and a shower room. There is a second shower room at the foot of the stairs that lead up to the first floor. Here, a large communal 'day room' leads onto an en suite double (with extra single bed), plus a double and a twin with shared shower room. The layout is labyrinthine, so please take a look at the floorplan (in the photos) to get a better idea of this huge property! At the bottom of the house is a large kitchen, another shower room and a dining room. There is also the owners' private wine cellar for which, upon payment of an additional security deposit, the key can be provided. The kitchen door opens onto a large terraced area for al fresco dining. Guests have use of a large outdoor table and chairs, sun loungers and a barbecue. On request we can arrange a cooking lesson at a local restaurant with an experienced English-speaking chef. Please contact us if you would like more information on this service. Booking well in advance is essential, especially in peak season, and depends on availability. Bathrooms 1 & 2 are on the middle floor of the house. Bathrooms 3 & 4 are on the top floor. Bathroom 5 is on the bottom floor. All bed linen is provided. If you wish to change the sheets during your stay, please contact us for prices. Free wifi available in some rooms, in the courtyard and by the pool. Please note that because of the thick stone walls, it is only available in limited areas of the house. There is a wood-burning stove in the main sitting room. A spacious and well-equipped kitchen. The kitchen leads directly out onto the outdoor courtyard. There is a large courtyard area directly outside the house. Our property manager will be there to welcome you on your arrival and to answer any questions you might have about the house and the area. You will also be provided with a comprehensive guide to the area before you arrive, so that you can plan any day trips etc you might wish to make. If you would like any help putting together a customised itinerary that will make the most of your stay, don't hesitate to contact her. She can also help with any bookings you wish to make and can offer babysitting services (please book in advance to avoid disappointment). We can organise cooking lessons for small groups at a local restaurant. The house is built on a slope and offers a great view from the patio. There's enough place for everybody to enjoy his privacy. The region is very beautiful and great for hiking and enjoying nature. There are very few tourists so you get a real taste of authenticity. Nice places to visit if you don't mind spending some time in the car. The house is not completely isolated but the adjacent houses aren't disturbing. The pool has a marvelous setting. The only minus is that it is too small to be enjoyed by all guests at the same time. On the other hand, there is a current down the slope where bathing is a fantastic experience. The kitchen is nice for cooking for and with a lot of people. We had a great holiday. Thanks for your lovely review. We enjoyed having you and your family and are glad that you enjoyed your stay! This home is very nice but it is in a rural area so if you rent it you want to make sure that you are aware that most larger towns are well over an hour away. Richard was great to work with and everything that we needed, he was very responsive. When we arrived, they had a wonderful basket of fresh veggies, bread, wine and spices. It was much appreciated. We had a group of 10 people, 6 adults and 4 kids and we were very comfortable in the home. The home has screens on several of the rooms but you should be aware that if the weather is warm, the house is very warm in the bedrooms but they did bring us fans when we requested them which helped. The kids loved playing in the pool and it helped us cool down with the hot summer days. This home is perfect for families that want to be off the beaten path and don't mind spending time in the car to get to some of the larger cities near by. We had a great time in the big house at Villa Bonicelli. Thank you. We had a great time. The welcome pack was exactly that - welcoming and useful - and the information (and map) proved extremely handy. We ate out four times, once in Bologna, and the local restaurants came up trumps. We particularly liked La Pioppa outside Villa Minozzo where we stopped on our way back from conquering the Pietra de Bismàntova. The baker's at Quara was a firm favourite and they did us a fabulous birthday cake for Nicole (6). Such a good cake, probably a good idea to order one, birthday or not! The river was also a bit hit with the children, who enjoyed clambering, collecting pretty pebbles and swimming in the deeper pools. The museum and castle at Montefiorino were also marvellous. We drove into Bologna once - we caught the train in from Castelfranco in fact - but that was so I could relive John Berger's book 'The Red Tenda of Bologna' and buy two metres of dark red linen from Pasquini's. Which I did! My daughter's family stayed an extra night to catch a Sunday flight home. They spent Saturday at the public pool in Toano which they liked a lot, and then stayed in Maranello and visited the Ferrari museum. This was a huge success, although it did include my son-in-law - with two children strapped to the back seats - driving a Ferrari at 200 km/hr along the autostrada. Quite. I am sending all this because we failed to complete the feedback form - which is odd because we'd kind of discussed it and were almost looking forward to doing it. Maybe it was too much like finishing the holiday early. So sorry about that. Maybe we'd have used an electric kettle and a coffee percolator had these been available. But we used nearly everything else and enjoyed the experience enormously. The villa was spacious and comfortable,and just perfect for our three generation family holiday.The welcome box of goodies was lovely and polly was really helpful before and during our stay,with tips on where to eat, etc.The walkers in the group very much enjoyed all the lovely trails right from the backdoor, the more adventurous had a fab time canyoning and for the ones that just wanted to chill , the pool area with that stunning view was just perfect.Will definitely be back!! The property has been described very well, no surprises. Everythong was very well prepared. We have also received a welcome basket from the owner. A nice surprise, very useful if you have not done you shopping on the way. The owner is very helpful. The house is located in the Appenine mountains. The upside is that there are many attractive places within a short distance or literally within the walking distance. A trip to Bismantova Rock is a must - the views are spectacular. Another fantastic place discovered thanks to the owner was Febbio which is within 30 minutes drive - the lift that takes you above 2000 metres. Then there are plenty of trails to choose from. We have also managed to visit Modena, Ravenna, Firenze and Cinque Terre. All places worth recommending, but in this case it takes longer to drive. When Google tells you that it wiill take you 2 hours to drive 100 km, you better believe it. Ravenna has been probably the longest drive but certainly worth the effort. We have seen the best Byzantine mosaics remained from ancient period. This is absoilutely different to all other medieval monutes one may find everywhere in Italy. A day in Firenze was also very enjoyable. During the holiday period one just needs to remember that Uffizi Museum tickets should be booked in advance. As it is mentioned in the description, the property is located in the village. It is not a "holiday resort". So you need to be prepared to experience normal situations that one might expect during the summer in the village: people work etc. Generally, very good value for money - worth recommending. For a full description of the many places that can be enjoyed in the area, please see our website www.coolretreats.com. In the immediate vicinity the river Dolo, which is in places deep enough to bathe, is on your doorstep and there are some spectacular walks that can be enjoyed directly from your front door. There's also a wealth of wildlife to observe – sharp-eyed guests might spot woodpeckers in the forest, deer in the fields and birds of prey circling over the mountains. This area is extremely popular with walkers, cyclists and bikers thanks to the stunning mountainous scenery. There are marked walking routes that can be picked up from Villa Bonicelli, from the river or from the nearby hamlet of Castagnola, including a Via Ferrata that takes you across a rope bridge (see photo). About 30 min away is the Pietra di Bismantova, a magnificent sandstone plateau over 1,000m high. It is a climbers' paradise, with about fifty routes and climbing variants. Guided treks, half-day climbing lessons etc at Bismantova can be arranged – please contact us for more information. The Parco del Gigante, one of the largest parks in Emilia, is great for walking and horse riding. The area has many restaurants and pizzerias that offer great value for money, including one approx 10 mins' drive away in Farneta. It is a friendly family-run restaurant with a lovely terrace on which to enjoy your meal. We have a partnership with this restaurant and can offer tailor-made cooking courses there on request (advance booking essential). It's a fantastic experience that comes highly recommended - our guests have said that it was a highlight of their holiday. For an alternative foodie experience, look no further than our local Parmesan producer in Quara to learn all about - and taste - the best Parmesan around! Get there early for a tour of the dairy and to see the artisans at work. Throughout summer and autumn there are 'feste' being held most weekends in one or other of the local villages, with the focus of the celebrations ranging from wine and beer to chestnuts, mushrooms and truffles, not to mention various obscure saints! The nearby towns of Toano and Farneta (approx 7km) has a good selection of bars, pizzerie, shops etc and is also home to one of the best preserved Roman churches in the Appenines. It also has a lovely outdoor swimming pool, which is open during the school holidays (early June to early September). Emilia Romagna is one of Italy's most prosperous regions and is famed for its culinary delights, making it an ideal destination for food lovers. Among other things, it is home to fresh pasta (tortellini, tortelloni...), ragù sauce, Parma ham, Parmesan cheese and traditional balsamic vinegar as well as Lambrusco, which is a light and very drinkable sparkling red. 'L'Antico Palazzo' is very well placed for a day trip to any of the main cities in Emilia Romagna, all of which are worth a visit. The ancient Roman town of Reggio Emilia is 50km away. Modena (60km) is a thriving city whose Duomo is considered one of the greatest examples of European Romanesque architecture and is now a UNESCO World Heritage Site. Parma, one of the most affluent towns in Italy, is 70km away. Bologna, the region's capital city, is a real delight, with its characteristic red-brick buildings and its over 40km of covered porticos (useful in bad weather). It is also home to the oldest university in Europe, founded in 1088, earning it one of its nicknames, La Dotta (The Learned). Also known as La Grassa (The Fat), Bologna takes its food very seriously; in fact, it is considered by many to be the food capital of Italy. This area is a car and motorbike enthusiast's dream come true - Lamborghini (Dosso, nr Ferrara), Ferrari (Maranello), Maserati and Ducati (near Bologna) all have their factories and museums in the region. For day-trips slightly further afield, a day at the seaside can be enjoyed at La Spezia or Lerici, both about two hours away – and don't miss the Cinque Terre, five beautiful cliff-top villages dotted along the rugged Ligurian coastline that can only be reached by foot or by train. They're charming and surprisingly unspoilt, thanks to their UNESCO status. Alternatively, head to the Adriatic coast to the legendary resort of Rimini, with its 15km of sandy beaches (2.5hrs approx). For those looking for a winter break, there are several excellent ski resorts within easy reach of Villa Bonicelli – Febbio (30min), Cerreto Laghi, Cimone/Sestola and Abetone (all around the 1.5hr mark). See www.coolretreats.com for more details. Golf: There are several good golf courses within an hour's drive of the house, including the 18-hole San Valentino Golf Club in Castellarano (approx 45 min), which is surrounded by over 130 hectares of woodland and green pastures and boasts 4 lakes; and the Matilde di Canossa golf club near the town of Reggio Emilia. We request a fully refundable damage deposit of €300, to be paid in cash on arrival at the property. Bookings during peak season are usually Sat-Sat but other arrival dates will be accommodated where possible. Our property manager will be there to welcome you on your arrival to help you get the most out of your stay. There is also a comprehensive guide to the area at www.cool-retreats.com.